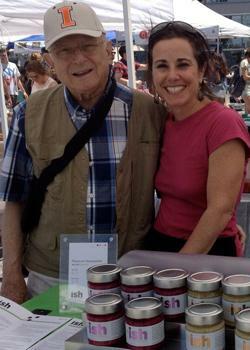 Making horseradish runs in Carolyn Sherman’s family. Her father, Lawrence, started tinkering with the recipe more than three decades ago. The goal was to make a prepared horseradish that would do justice to his mother-in-law’s gefilte fish. And for a man devoted to the family vegetable garden, farm stands, and Chicago’s Randolph Street Market (the equivalent to New York City’s Hunts Point market), there was only one solution: Go straight to the source. “He knew that when you start with a fresh fruit or vegetable, it tastes so much better,” Sherman said. He eventually built up such a following that he was delivering 200 jars of horseradish to friends and family. When daughter couldn’t convince dad to start a business selling the stuff, she took it upon herself to do so. Part of that process was getting to the root of the horseradish, so to speak. Sherman says her dad tried to grow his own horseradish root in said garden. “It’s very pervasive, though, so after a year or two of that, he realized this is not good, I don’t need to grow my own,” Sherman explained. Fortunately, for the Chicago-based Shermans, Collinsville, Illinois, also known as the horseradish capital of the world, was close by. Now, she sources fresh horseradish root for her product, ISH Premium Horseradish, from Collinsville, as well as from Tulelake, California. Both locations have soil that is naturally high in potassium, the best growing environment for horseradish. 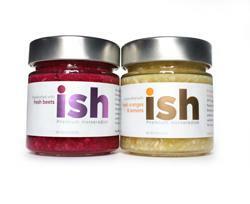 ISH comes in four flavors — beet, citrus, ginger, and garlic — that are derived from the original recipe Sherman’s father created for beet horseradish. Sherman knew that working with fresh horseradish root wouldn’t be an easy task, though. That bite from fresh horseradish mellows when it’s used in cooking, though, says Sherman. She created the different flavors to encourage people to use it as an ingredient, instead of only as a topping. The added bonus is that horseradish contains more Vitamin C than oranges. She also advocates trying it with cheese and crackers, mixing it into tuna salad, or even using it as a topping for vanilla ice cream. Below, try her recipe for Sauteed Whitefish With Citrus or Ginger ISH. Another delicious way to prepare fish.This will have you wISHing for more… Sautee 1 tablespoon butter, 1 tablespoon of olive oil, and 1 scallion (diced) in a pan until scallion is soft. Dust pan with kosher salt and place 2 fish filets (basa/swai) in pan; sautee on medium heat, sprinkle with kosher salt and black pepper; cook for 7 minutes and then add 1-2 teaspoons of Citrus or Ginger ISH on the top of each filet; spread evenly. Cook 5 minutes longer and then gently flip; spoon the butter/scallion mixture (and any extra ISH) over the fish. Cook for another 5-7 minutes and remove from pan. Spoon the remaining butter-scallion-ISH mixture onto the filet and serve.